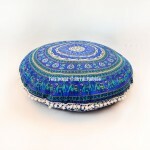 Add comfy, coziness, colors & bohemian look to room flooring with Indian mandala square floor pillows. Put them around coffee table and have fun with family or friends along with the couch. 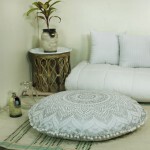 Mandala square floor pillow add new level of comfort and functionality to living room. Made from 100 percent cotton material and finished with all edges perfectly. Browse our 36 inch extra large square pillows that capture enough space of your floor area so your guests feel extreme comfort. Spread boho colors in your living space and receive appreciation from your friends. Multipurpose items that can be used for outdoor as well as Indoor. It is easy to carry and easy to use, a perfect piece for floor decor.